The doctor will see you now! 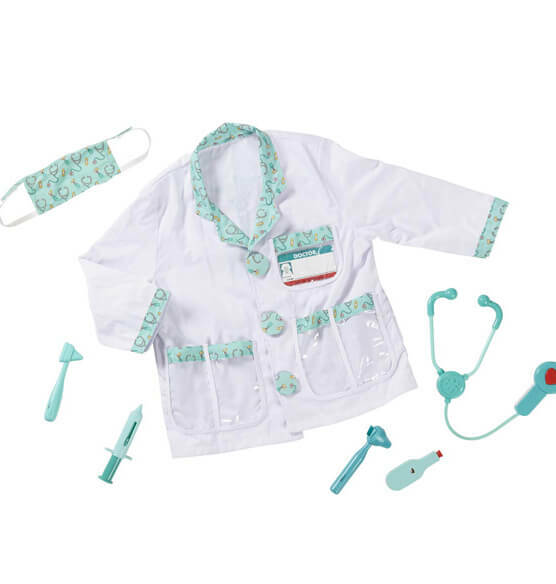 With this Melissa & Doug® Personalized Doctor Costume Set, your little doctor will be fully equipped with a jacket and face mask, a stethoscope with sound effects, a reflex hammer, an ear scope, a syringe, and a name tag to personalize. Fits ages approx. 3-6. Express shipping not available. Please allow 2-3 weeks for delivery. My grand daughter is three and always says she wants to be a Dr to help her mom fight kidney disease. She and her mother are suffering from. So little but so smart. This is perfect for her. My daughter loves to make her baby dolls and stuff animals feel better. It was able to be personalized and looks like good quality. help kids understand Doctor's is good and not to be afraid of when come time for check up. The picture has the name embroidered on the coat. Is that what is "personalized" or is it the name tag that is included? 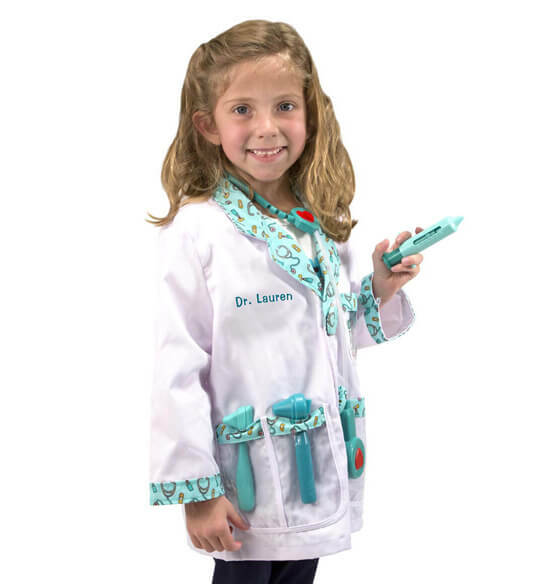 If it is the coat, do we need to put "Dr." in the personalization line or will Dr. be on there anyway? BEST ANSWER: Thank you for your question. The personalization is for the coat and Dr. is not pre-printed. We hope this information will be of help to you. BEST ANSWER: Thank you for your question. The measurements are 24” long and 17 ½” wide. It should fit ages 3 – 6. We hope this information will be of help to you.